We are Big Fat Vegan Mofos! Hey everyone! Over here at Big Fat Vegan Radio we have decided to participate in Vegan Mofo 2012 and we are SUPER JAZZED ABOUT IT!! If you don’t know about Vegan Mofo or you haven’t heard about it before please check out all the info here! Anyways, in our usual Big Fat Vegan spirit we have decided to feature our everyday foods and how we eat as the extremely talented and funny vegans that we happen to be. Of course this will also include outings, special treats, recipes, etc. As always we just hope to spread veganthusiasm, and show everyone how easy it is to live a vegan lifestyle. We hope you enjoy our posts! First up! BREAKFAST Ben has got a new favorite and you’ll never believe how easy it is to grab on the go! I ordered this along with a banana, a package of roasted almonds, and an “Iced Venti Iced Coffee Unsweetened No Room”. I love that I have to use this many words to convey “a large iced coffee”, and I also love that in Starbucks speak, they call it an “Iced Venti Iced Coffee” — but if that’s how they call the drinks out, then that’s how I wanna order it! This breakfast is filling and delicious, and as you can tell, pretty easy to customize to your own personal taste. Over on the west coast, Laura has been having something new for breakfast too. Well, as all of our listeners know, Ben has been hounding me to try Almond Dream yogurt and as I am a die hard So Delicious fan, I have been putting up a bit of resistance. 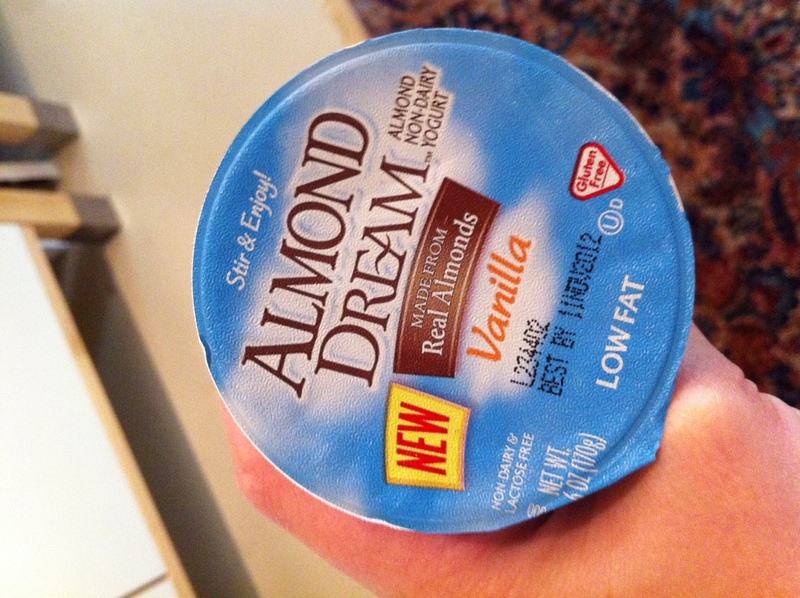 Not to mention that I’ve never actually SEEN Almond Dream yogurt anywhere. Anyways, I was up in San Francisco recently and I went shopping at the infamous Rainbow Grocery. I’ve been dying to check this place out and low and behold, what did they have in the cold case? I had to buy a few containers to give it a try and the verdict is in! I love it! Fabulous texture, great flavor, and it’s a good sized portion too. 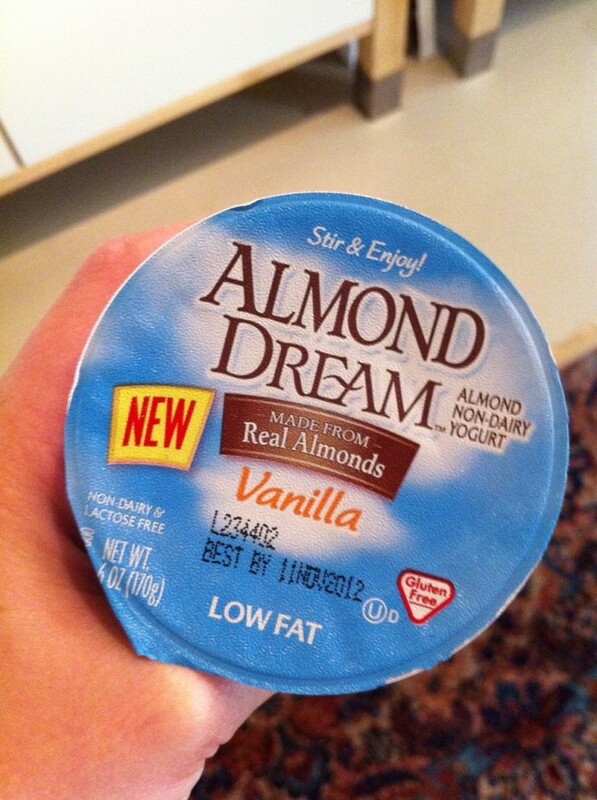 Almond Dream is officially on my “vegan yogurts I like” list and I won’t lie, it’s a short list so congrats Almond Dream! That’s all we’ve got over here from BFVR for Vegan Mofo today! Stay tuned all month for our fun updates about our favorite thing, FOOD. Happy Monday everyone! 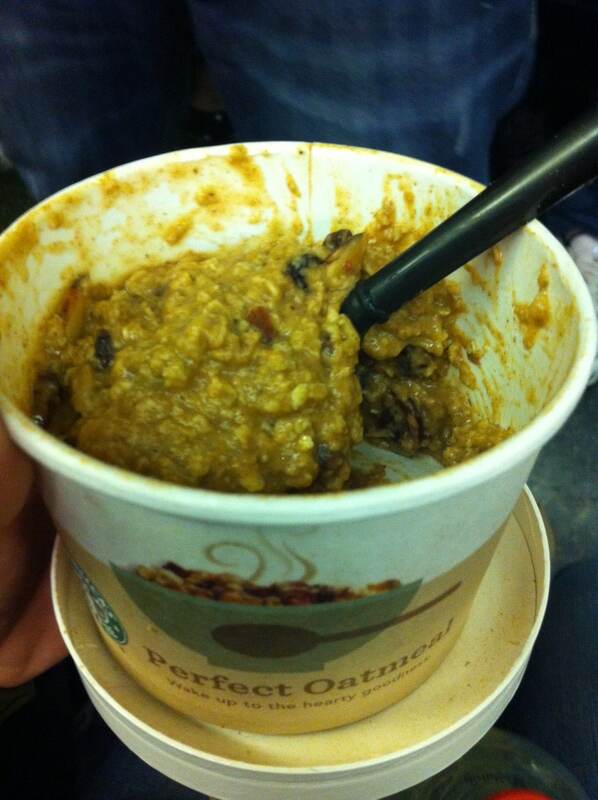 i didn’t know the starbucks oats were vegan. i must be living in a cave. Oatmeal porridge is one of the ONLY vegan things I cannot swallow. I love oats and I love all the stuff that goes into a proper oatmeal. I just hate it! But I want to love it, cuz it’s like the perfect food! I’m gonna hunt down that yogurt, sounds delish. Nice! & You’ve just reminded me I need almond yogurt!